June Mountain is a smaller resort about 20-miles north of Mammoth. It is often overlooked due to it’s huge neighbor to the south, but we actually like it better in some ways. We went to June in late February 2015 and they had only gotten about 65-inches of snow. It had also been breaking high temperature records for months, so we were expecting the worst. It actually ended up being one of the most fun days of non-powder skiing we had all year. The vertical drop at June is a very healthy 2,600 ft., but the bottom 1,300 ft hasn’t been skiable since 2011 I was told by a lifty. 2011 was an exceptionally snowy year, so the REAL vertical drop of this place barely qualifies for our list at 1,300 ft. They don’t have enough water to do any serious snowmaking, so actually covering runs is not possible and they just rely on natural snowfall and use snowmaking for patching according to the same lifty. So your day at June begins by handing your skis to the lift ops at the bottom who set them precariously on the arms of the ancient center-bar double. You load the chair without skis on. It’s a strange experience riding a chair with ski boots on but no skis. At the top there are two people who help you get off without getting run over by the chair (not a problem with skis on!). The mid-mountain is the real base of the mountain and has an ancient lodge called the Chalet. The food options there were standard cafeteria fare, but prices were reasonable and the lodge had a very friendly vibe with a roaring fire going. It reminded me of what skiing was like in the 70’s and early 80’s. I think that lodge has been there since the 60’s when the resort was built. From mid-mountain you can take one of the 2 high-speed quads up to the left summit, or take another ancient fixed-grip up to the base of the other summit. The terrain just above the Chalet is pretty flat and not worth skiing other than to go down for lunch or at the end of the day. 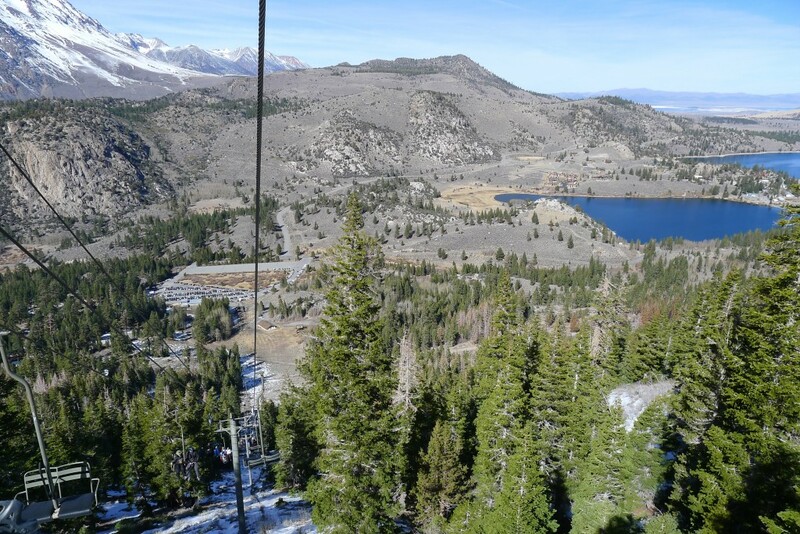 The J7 lift is the best part of the mountain, going up to 10,090′. We skied every run on that lift during the day and really enjoyed it. 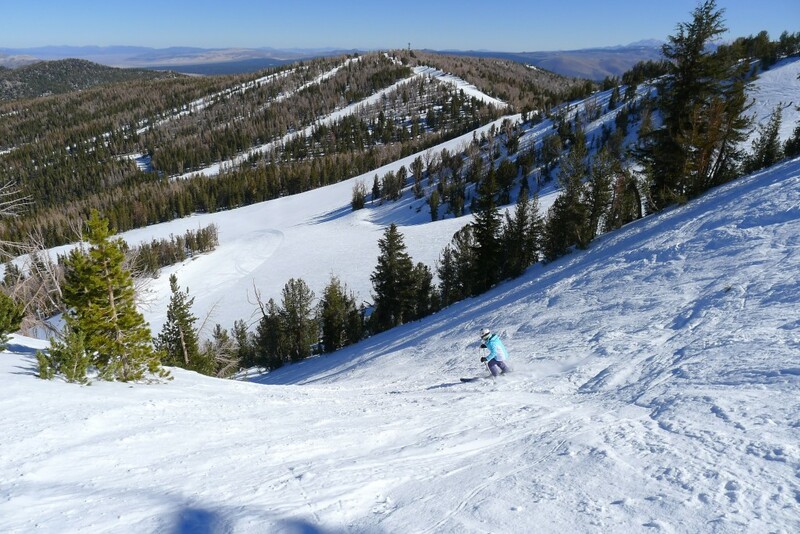 The snow conditions were dry and chalky where it hadn’t been groomed, with almost no moguls due to the low skier traffic. The groomers were in great shape and it was fun laying down some high-speed turns. The ratings of trails at June are decidedly on the “stretching it” scale, with 3 double-black diamond trails that we had no trouble or hesitation with. The J6 and J4 lifts serve the other peak, which is just 40′ lower. This was a little too flat for our liking, but the grooming and snow were excellent. It’s hard to explain why, but we had a blast at June. 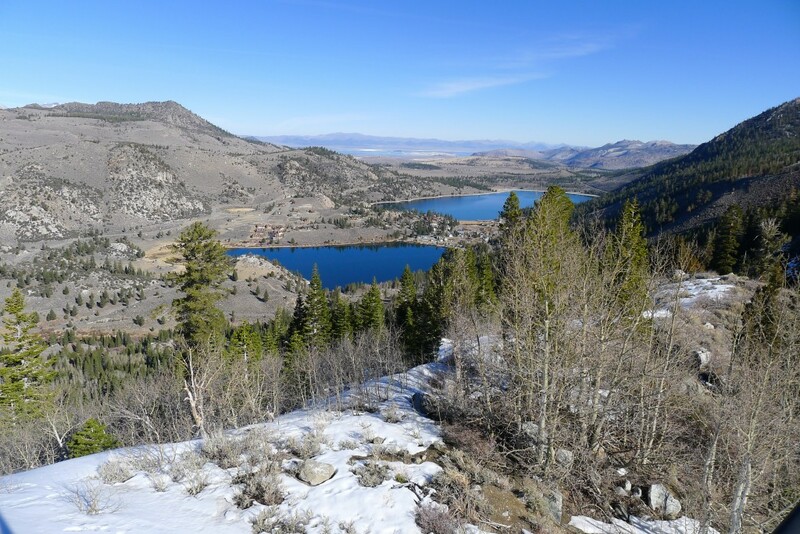 We would normally rate this place a “2”, because by every measure it’s lacking, but the snow surface isn’t hammered by hordes of skiers like it is just about everywhere else in California, and the elevation and location in the Eastern Sierra keep the snow dry. The runs on J7 are a great pitch, and don’t intersect much so you get a nice long straight shot on each, and they are all different. The guests and employees we talked to were all happy to be there, and there certainly isn’t any attitude at this place. The obvious problems here are lack of snow, no snowmaking, some ancient lifts that need replacement, and super old lodges. 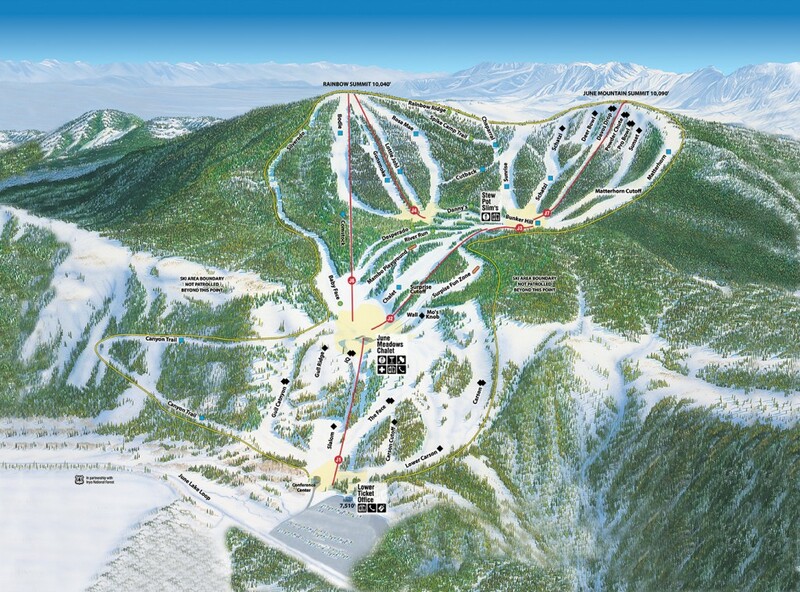 These factors caused skier visits to drop so low that the owners (who also own Mammoth and Bear Mountain), closed the place in 2012-13 due to pressure from their banks (they say). After getting finances straightened away and after a lot of community outcry, they decided to reopen it the following year even though it’s probably a money loser. This is too great of a place to let stay closed. We really had fun on the 3 “double-black” run on the top half of the J7 lift. We love the Eastern Sierra and would definitely go back to June, but it probably wouldn’t be a dedicated trip to JUST ski June. 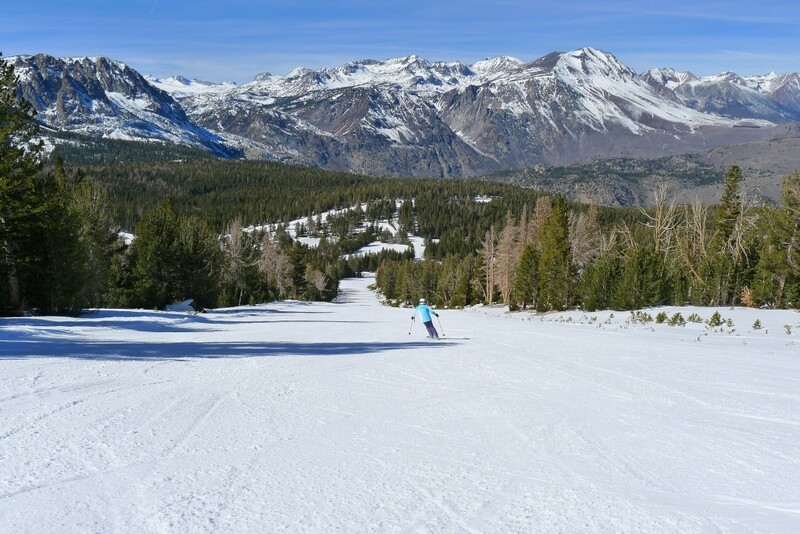 We would probably spend only one-day at a time there due to the small size, and spend another day at Mammoth. We aren’t super fond of Mammoth so it would probably be a 2-day trip. This is a new section for us. This was the first ski area we visited with our Truck Camper. We stayed in the Mammoth RV park in Mammoth Lakes, which has electrical hookups and the usual facilities. It’s quiet but a little expensive at $55/night. For free camping they said we could camp overnight in the June parking lot if we wanted to, but a nicer option might be any of the many dirt roads in the surrounding BLM land. We noticed some spots off of North Shore Dr. back toward highway 395. The campground there is closed in the winter.